Happy Valentine’s Day from Nandina Home & Design! We hope your day is filled with the people and things you love the most! In honor of this special day, we decided to feature room elements and design that we love — ALL IN RED! In many cultures around the world, red represents beauty. Not surprisingly, red is a great color for attracting attention which makes it a perfect accent color. Below are images of red furniture, fabrics, walls and rooms in honor of Sweet St. Valentine. Enjoy…And kisses to you! We adore the combination of chocolate brown, pink and red colors in the fabric and the feminine shape of the headboard. 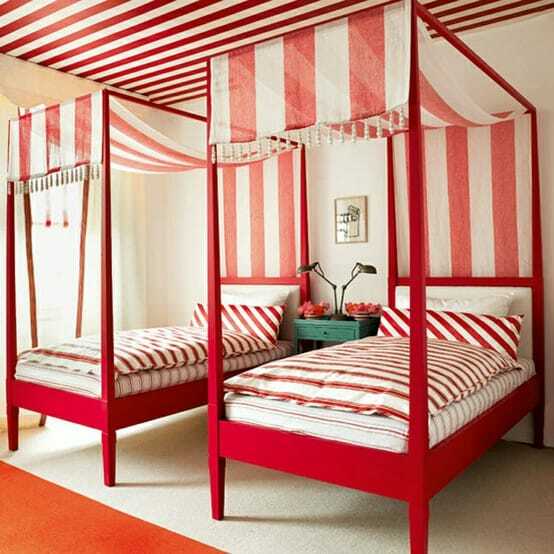 Darling guest or children’s room — red stripes add a fun punch of color to this bedroom. Bold red color accentuates the Asian inspired furniture making it even more exotic! A high-gloss, high-intensity kitchen backsplash in red = LOVE! Great idea for tight spaces – These red and white curtains help create a cozy play space or bed nook. The red Peacock Vase is sure to make a statement in any home. Chloe Dining Chair in red would perk up your dining room! What’s your favorite way to incorporate red into a room? Leave a comment to share your thoughts with us! Happy Valentine’s Day from the Nandina Team!